This last round of sea trials has actually been on the sea. The other day the boat and I took off from our little spot behind Goose Island, early to catch the tide, with the idea of going into North Cove in Old Saybrook. This was about 4 miles further down the river, quite near to where the river opens onto Long Island sound. North Cove is a good place to stay, sheltered from the river and boat wakes, but on the ocean side of the sometimes difficult drawbridge, and a great jumping off place for trips into the sound. As it turned out, even with some ignominious stops on the sandbars south of Goose Island, we were at the entrance to North Cove by about a quarter to eight in the morning. It was a beautiful day, and the breeze was much too nice an opportunity to decline. I had a theory that it might make sense to follow the tide out into the sound, sail around for a while, and then when the tide was going back in, to return to North Cove for the night. That definitely would have been the sensible option. Another possibility, once I was a couple miles out from the river entrance and the tide had turned westbound into the sound, was to sail west. That really would have made sense. There is a perfectly good anchorage at Duck Island, about 5 miles west of the Connecticut River. With the tide running and the breeze, we would have been there in no time, having had a nice sail. I really considered that option, measuring against the desire to go east… Of course one can see where this is headed. East was a bust, against the current, even with a favorable wind. But angling across, and taking a good long time about it, meant arriving at Plum Gut with the current going the right way. That’s important, for that passage – without a massive motor, there is no going through Plum Gut against the tide. Even traveling with the tide it can get interesting, as the contents of the wide part of Long Island sound rush in and out through a few narrow passages. The “boils,” or upwellings of current, are particularly impressive. The wind does tricks in here too. It’s quite common for the wind direction in Long Island sound and that in Gardiner’s Bay, on the other side of Plum Gut, to be opposing. This leaves a big calm spot right where you would most want your best wind. No wind, and an impressive, wide, jouncy tide rip. If you line up for it properly this is not a huge problem, as the current will carry you right on through, but it’s important to be on the correct track to miss various rocks. We came in a bit low – in hindsight, it would have been better to change plans and continue down the north side of Plum Island. Instead, hoping to go into Orient Harbor for the night, with some chagrin I turned on the motor, in order to go across the current enough to maintain a comfortable margin around the bit of rocks near our path. This worked out fine, and once safely clear, off went the motor, with the boat now in the middle of the various waves, boils, and practically no wind. The boat, already problematic about holding direction with the new rig in very light wind, thought that the concept of direction in this situation was utterly ridiculous. Knowing we were perfectly safe, I was just left with the task of relaxing about looking ridiculous to any outside observers. We traveled backwards, sideways, and did a couple of full circles. Now and then we would actually be going the right way, but then, just like in a rushing river, we would hit another swirl, and be turned wherever it took us. For a couple of minutes I ran the motor again, which sorted out the steering, but it didn’t seem worth using up so much battery reserve for something that wasn’t really a problem, so I turned it off. By ten minutes later we were out the other side, with a light breeze from the new direction. Orient Harbor didn’t turn out to be reachable, given the wind and ebbing tide. Even getting inside Gardiner’s Island, with various possible anchorages, didn’t work out. On the bright side, what we did have was wide open water. Montauk Point was about 10 miles away in the direction we traveled easily, and if the wind quit it would be easy enough to just stay out, with no worries about things to run into in the night. In the end, the wind kept up for long enough to eventually get to the entrance to the harbor at Montauk. It took until about nine o’clock that night, and I had some concern about going into the harbor in the dark – I’d only been there once, about 12 years ago. But it’s pretty basic, and well lit. The motor came on again, at the outer breakwater when the wind went still. 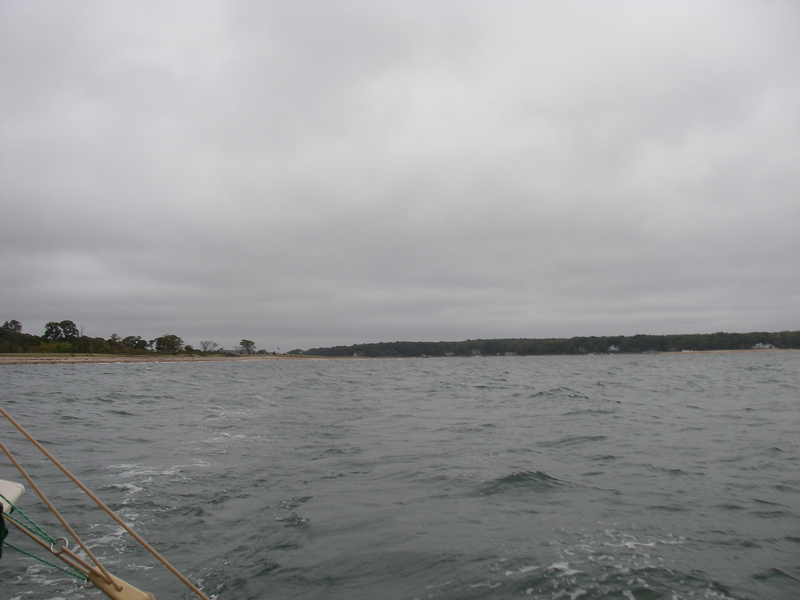 By 20 minutes later we were anchored inside Lake Montauk. “Motorless in training” has taken a bit of a hit this week – but I’m learning from every round. The boat is doing well, though it’s involving some getting used to, adjusting to the new rig. 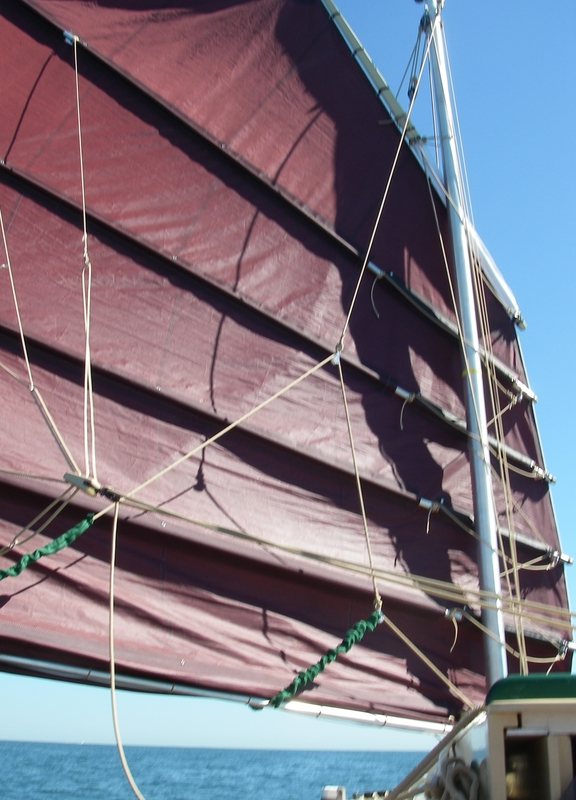 Learning the sail controls is one aspect of that, but the more noticeable change is that the boat handles differently. It’s a little frustrating, to feel so awkward at maneuvers that had become quite fluid. I used to know what the boat could do, and how to get it to do that, fairly reliably. 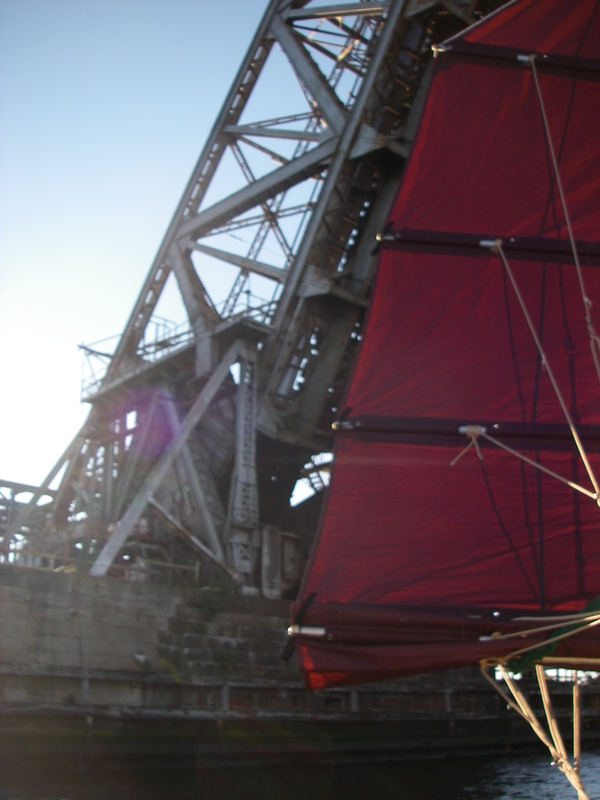 My latest guess is that the large mainsail area forward of the mast is a big part of this different feel, and handling. 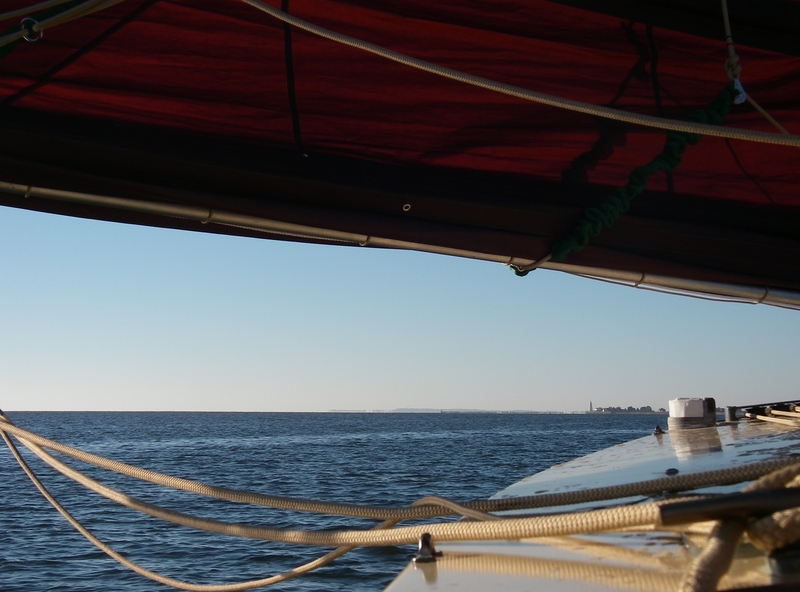 The new easy reefing is worth a lot, and gosh it’s fun when the boat drives along in a good wind – I’m looking forward to becoming more adept. It turns out that Lake Montauk is a party scene. Blasting dance music comes from clubs on the shore, and row after row of marina docks are filled with varying sizes of recreational fishing boats, and go-fast noise machines called “cigarette boats.” There’s also a substantial commercial fishing fleet, though that was pretty quiet on the weekend. My nighttime arrival was on a Saturday, during an unusually warm weekend of beautiful weather. On the plus side, it was sweet, approaching the harbor to the smells of seafood and hot summer town. Once anchored, the music started, and then stopped, and then started again. Knockout tired, I was asleep soon regardless. There were a few wake-ups to more music, well after midnight, but eventually it was quiet. Then in the morning the engines began – for some reason that I don’t understand, cigarette boats seem to have a need to run in place for a long time at the dock before they get around to leaving. With the cost of fuel these days, I wonder at this, but maybe they want to make sure that those racecar style engines are warmed up enough to not stall when the driver hits the gas. Whatever the motivation, it was a rude awakening in the morning, that went on and on. My original plan had been to stay at Lake Montauk for at least a couple of days, resting, and waiting for the northeast wind that was going to be coming along. By noon of that day, however, there was a sweet southwest breeze, and all I could think was how easy it would be to sail out of the narrow harbor entrance, without the motor, on that wind. And the blessed quiet that I had experienced all the previous day, out to sea. Off we went, once again with Orient Harbor in mind. Fishers Island was a consideration, but the tide was backwards for getting through that pesky outlet from Long Island sound. The wind blew pretty well for a while, and by late in the day we had gotten almost around Gardiner’s Island, before it slacked off. The forecast was for the wind to pick up from the southwest in the evening, which was part of why I thought it was an okay idea to try for such a long trip in the first place. Later on, the breeze started, developing an interesting chop, which we were trying to sail into. It took all night. Tacking into the chop, sometimes driving well, sometimes not so well, trying to judge the speed of the water past the boat in the dark, and the best heading, with the autopilot sometimes content and on track, and sometimes wandering widely. On the plus side, it was an absolutely beautiful, warm, perfect night. The crescent moon set fairly early, and there were lovely stars. There was no traffic, and I thought many times about how extraordinary it was to be out there having that entire huge bay all to myself. The ferries came around Orient Point in the distance, lit up like cruise ships, moving predictably and well out of the way. Gradually we advanced on the various lighted markers. In the dark, progress was measurable both by plotting on the chart, using GPS latitude and longitude, and also by leaving lights gradually off the beam and then behind us. (Taking bearings on lights would have worked also – feeling tired, I opted for saving my strength and using the GPS.) But looking at the lights ahead was another matter, as far as judging distance by eye. They seemed so close, and at the same time so unattainable. I haven’t done that much night sailing close in to shore, and it’s an interesting process, learning to interpret what you’re seeing in the dark. After finally reaching two or three of these lighted buoys, I noticed the way they brighten when you get close, and you can see the light reflected in the water, as well as the height of the buoy extending above the skyline, to let you know that you are indeed within something like 100 yards. A chartplotter (electronic gizmo that shows both the chart and your position on it on a screen) is starting to look a little more appealing, though for now I’m still a holdout. Manual plotting of position feels both satisfying, and helpful, but I’m still working on relating that calculated position to my intuitive grasp of the situation in the face of confusing visual cues. As if that wasn’t enough of a challenge, a couple of times my eyes played tricks – maybe from being overtired, as well as from the unfamiliar darkness. Lights on shore appeared to be close, as if they were nearby in the water. 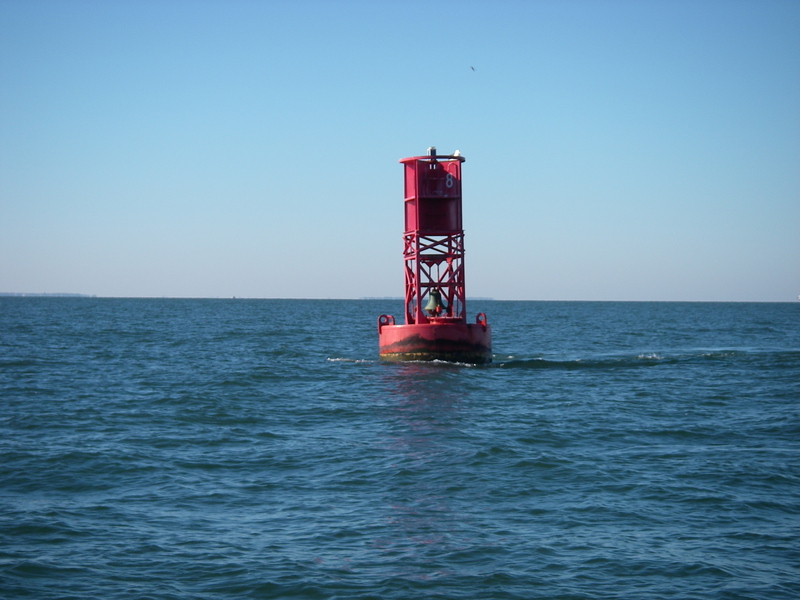 I was startled to think, at one point, that I was approaching my initial buoy goal but that it now appeared to have two smaller lights nearby, on the kind of thin stick buoys set out privately in harbors, although these did not show on the chart. I was jumpy with thoughts of hidden obstacles like fish weirs, to avoid running into. Then shining the spotlight on them, there was nothing there, and suddenly it all came into focus. My initial buoy was still there, though at a substantial distance, too far for the spotlight to pick it up, and the other two stick buoys were actually distant house lights on the shore. Jeez. This happened again later, approaching my harbor entrance, where there was an oddly lit flag on a pole, that looked for all the world like a triangular apparition hovering about 50 feet away from the boat. Again with the spotlight there was nothing there, and two blinks later the flagpole and it’s strange lighting came into clear resolution on the shore. I keep thinking about all-night drivers talking about seeing giant bunnies the size of cars, hopping across the road – hallucinating from exhaustion. I’ve never experienced that, in spite of many all-night drives, but I wonder at the source of these strange perceptions, losing any sense of depth and distance awareness, and if it has anything to do with that sort of process. 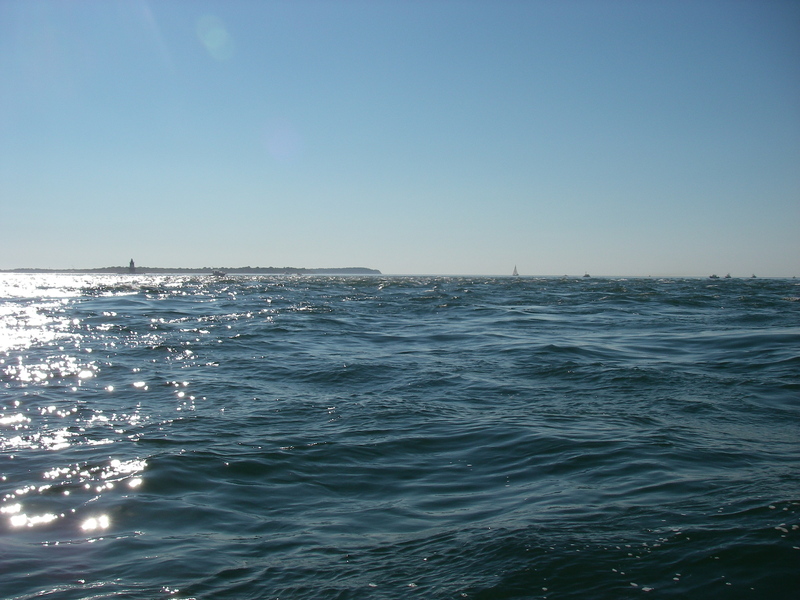 Eventually there was a choice – slog on for another 2 miles close to the now minimal wind, to one harbor entrance, or crank up the motor and go 1 mile to the nearer harbor entrance, directly into the fading breeze. Thinking all the while about how I wasn’t exactly succeeding at motorless in training, I opted for resting sooner, blessing the fact that I had the choice. Still, on slow speed because that preserves battery energy, it took about an hour to get to the harbor entrance. But the slow speed was worth it, because when we got there the tide was rushing out the narrow entrance, and the battery still had plenty of reserve to crank up and push the boat through. The dawn started to come up as we were anchoring. There are several things I might have done differently in that night, but staying in Montauk harbor probably wasn’t one of them. Sailing out to sea might have been nice, and would certainly have been more restful than sailing close in. You can take naps when it’s just open water. But you never know how things might go – getting back to land might have been more of a chore. As it is, there have been more boat studies, tinkering with euphroes, and learning more about how to make realistic judgments about possible forward progress against wind, current, and chop. I’ve been learning this new area, of Shelter Island and Gardiner’s Bay, and having a lovely time being back on the open water. It’s all good. Just around the corner, 2 miles down, is the entrance to the next series of harbors that circle Shelter Island. This was the destination that had seemed too far the other night. The wind was now blowing about 12 to 14 knots, and made for a lovely sail out the mouth of Coecles Harbor, just, and then around the next point going east. There was some rain to begin with, but by the time we arrived inside Northwest Harbor, near the town of Sag Harbor, New York, everything was drying out. 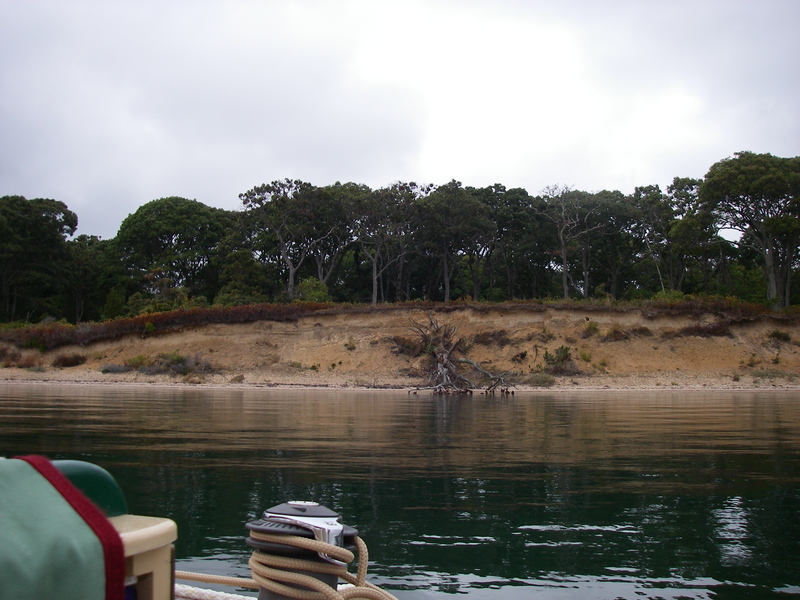 In the search for the combination of protection from northeast wind, and a little more quiet, we anchored further up the bay, away from houses and in the lee of a great bluff with a nice stand of mature trees on top. It’s not perfectly snug – the bay is broad, with gentle but constant rolling from the wake of a continuous back and forth tiny ferry, that is distant but seems to send waves ricocheting constantly throughout the area – but it’s safe, and it’s not pounded by that big wind, that you can see shaking the trees up on the bluff. And it’s quiet. There’s just the sound of the waves breaking on the far side of the point. Quiet and out of the wind – worth a little rolling! Tomorrow the weather is supposed to clear up, and I’m thinking about continuing around Shelter Island, to see the sights. If this works out, the waterway will eventually open again into Gardiner’s Bay by passing through Orient Harbor. Maybe I’ll finally get to see it, the long way around! Hi, Shemaya! Good to hear you are adventuring again. Your disorienting experiences sailing at night reminded me of a night trip in that same area. 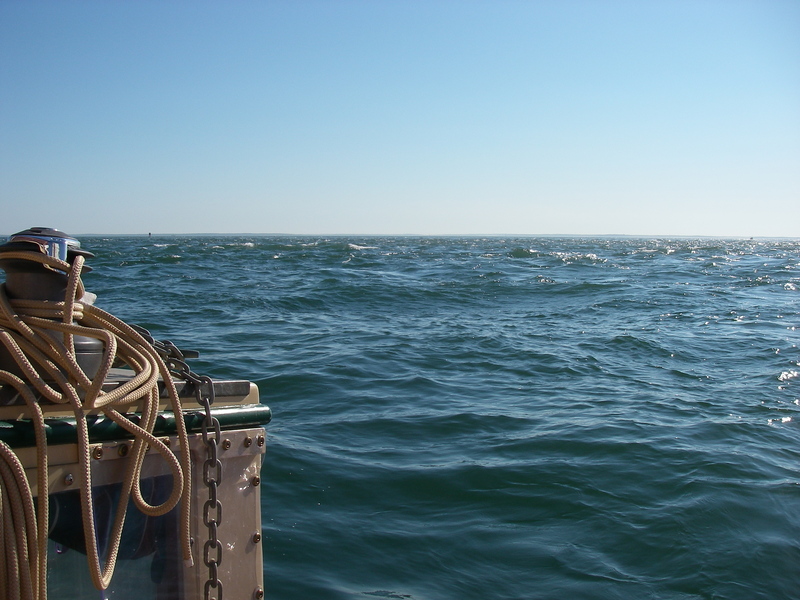 We were sailing to Montauk from Pt Judith, RI in modest winds with too little sail set. (Strong winds had been predicted, prompting me to move masts, furling the main and sailing on centrally stepped mizzen alone, but the strong winds never materialized. Approaching the lighted buoy not far out from the entrance to Lake Montauk in darkness on starboard tack, I decided to shave it a bit closer. Then closer still. 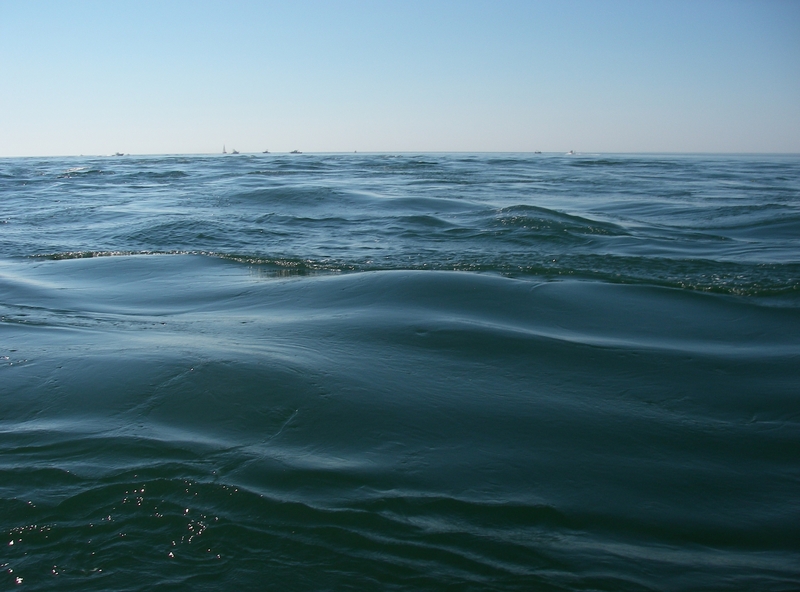 Then I was past it, the boat suddenly jibed, and I found myself looking at Montauk light on my starboard side–I had just rounded the buoy and was now headed back where i’d come from. Fortunately, we got the anchor down at the north end of the pond and I got some sleep. That was a good trip, overall, with gorgeous late afternoon clouds and sunset. and surfing the waves with my boys at up to 10kt going home two days later made up for the slow trip out. That’s quite a story, your sail from Point Judith to Montauk and back. Towing a kayak no less. Maybe one of those snug cockpit covers would help with the kayak? The kids look great, steering away. I’ve had some success with a small waterproof battery-operated flashlight with a Fresnel lens, for a small boat anchor light – works pretty well if it’s hung in the rigging and then tied from below so it doesn’t swing. We’ve used that on the Peep Hen. I think they’re actually marketed for kayaks… So glad things worked out all right with that fishing boat – what a way to wake up. Great blog post. I love the pictures! Thank you for your birthday message. It’s a busy work week. I hope we can talk soon. Looking forward to whenever we catch up – the boat phone is working!